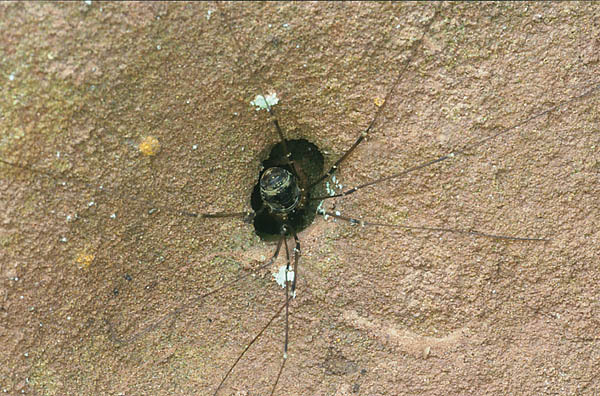 The harvestmen have oval, sturdy bodies, with eight thin, segmented legs that regrettably very easily come loose from the body. Sometimes we meet six- or seven-legged harvestmen whose movements are somewhat groping, but they still manage. The harvestmen do not count as spiders because they lack the glands needed spinning a net and also the poison glands of spiders. The „non-spiders“ are active in the darkness of the night, in daytime they huddle stiffly in shadowy, damp places. Colour varies from dark grey to black.